The 2015, Pan American Games, held in Toronto, saw a massive celebration of sport, art and culture throughout southern Ontario. The Pan Am Path, created as a legacy of the games by the City of Toronto and its partners, including Toronto and Region Conservation (TRCA), contributed to the excitement of the summer games. Celebrating Art and Culture associated with sport, the Pan Am Path Art Relay merged 80 km of interconnected trail systems across the city from the West branch of the Humber River, across the Waterfront Trail, to the Rouge River at the city’s east end. Curating the celebration and legacy of the connected pathway, The Friends of the Pan Am Path, along with over 100 partnering organizations, celebrated each leg of the Relay with a series of art installations and artistic performances. 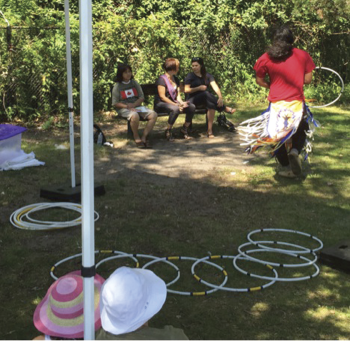 The Humber River team at TRCA was a sponsor of the Art Relay and celebrated alongside the Friends of the Pan Am Path at each of the events along the Humber River, as well as at the grand finale event at Rouge Beach. Over 2,600 guests attended the five events sponsored by TRCA, bringing local community organizations together and fostering new connections along a shared Pan Am Pathway. As a part of the Pan Am Games legacy funding, the City of Toronto and its partners will continue to finalize connections along the pathway, solidifying an active transportation network across the city.